Questions, or interrogative sentences, have a special end punctuation mark: the question mark! Get to know the question mark by looking at each question, then determining if it's punctuated correctly. © Learning Horizons Inc. All rights reserved. Year three writers often need extra support with the rules of capitalization, puncuation, apostrophes, and proper nouns. 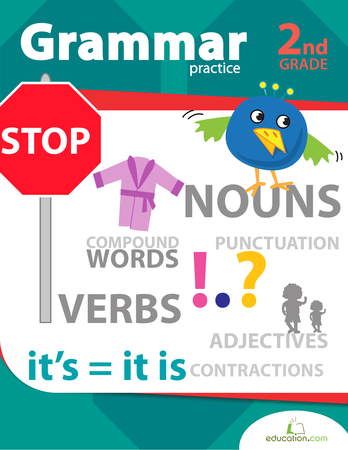 The exercises in this guided lesson cover these four key grammar rules, and provide kids with targeted exercises to help them practise writing with correct grammar usage. 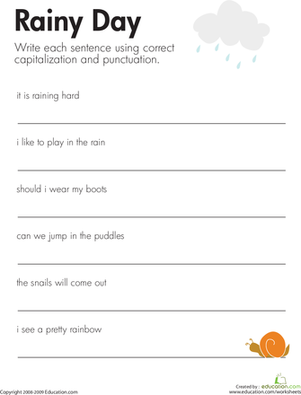 To help gain even more practise with new writing skills, download and print the capitalization and punctuation worksheets suggested as part of this lesson. Year three writers often need extra support with the rules of capitalization, puncuation, apostrophes, and proper nouns. These sentences about bike riding have errors. Kids rewrite the sentences using correct capitalization and punctuation on this year three writing worksheet. These sentences about rainy day fun have errors. 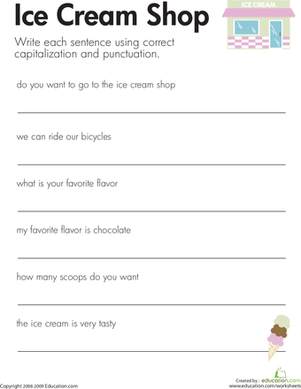 Kids rewrite the sentences using correct capitalization and punctuation on this year three writing worksheet. The main idea is the most important idea in a paragraph. With this worksheet, students will read the paragraphs carefully then circle the statement that best fits the paragraph's main idea. 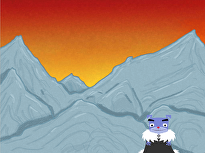 Put proper punctuation into practise with this Bigfoot read-along worksheet. Do your students struggle to remember irregular verb tenses? Use this great matching activity to help students connect the present to the past. They'll be using irregular past tense verbs with confidence in no time! 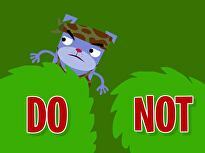 What difference does a preposition make? A lot! 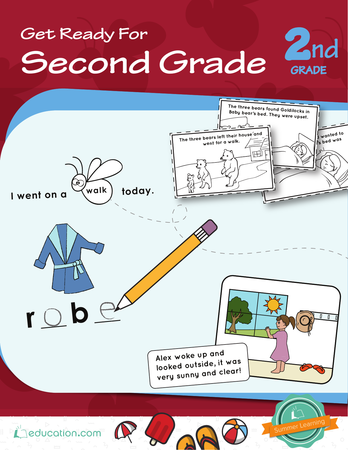 Your students will see this firsthand as they complete sentences by filling in the missing prepositions. This story about getting ice cream has errors. 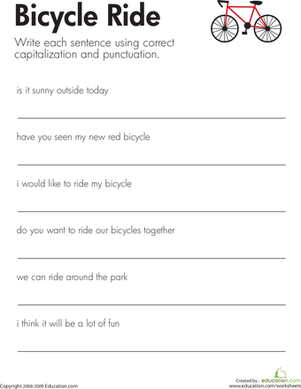 Kids rewrite the sentences using correct capitalization and punctuation on this year three writing worksheet. Help your students practise reading fluently with this passage with exactly 100 words. Who, what, where, why, when: These are five very important words in our language. Use this worksheet to practise them!